You are buying Enfamil PurAmino 14.1oz Infant Formula Powder Each, Model #4807624. ADW Diabetes offers a complete line of Enfamil baby formula products both in liquid and powder form. We offer these items in both single and discounted bulk quantities for your convenience.At ADW Diabetes, we offer fast shipping, great pricing, and excellent service on all of your baby formula and health care needs. The Enfamil PurAmino 14.1oz Infant Formula Powder is scientifically designed for infants and toddlers with severe cow's milk protein allergies and/or multiple food protein allergies. It may also be suitable for conditions requiring an elemental diet such as protein maldigestion, malabsorption, short bowel syndrome, and eosinophilic esophagitis. 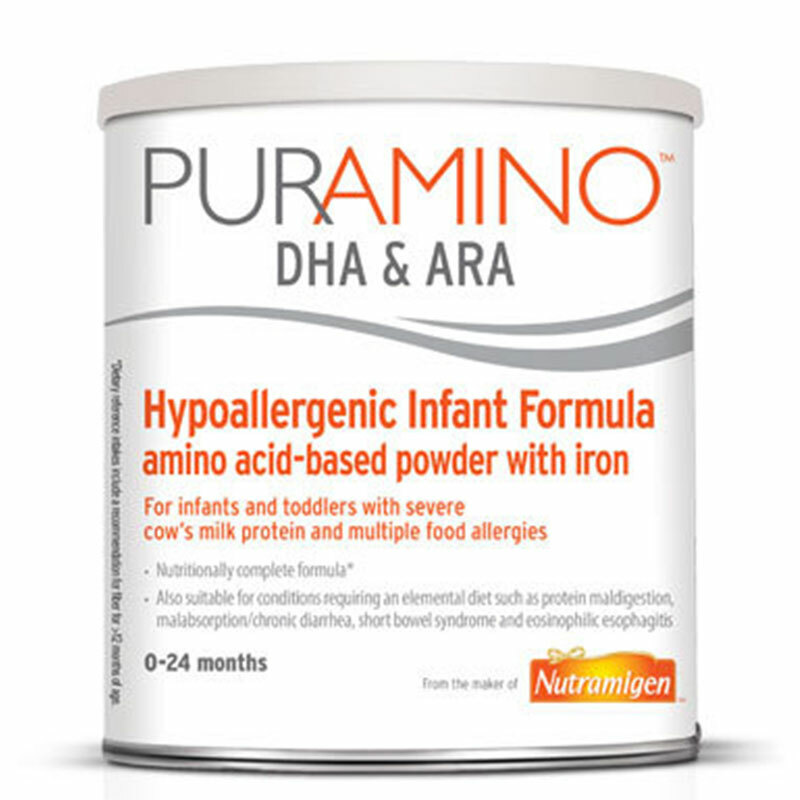 Nutritionally complete, PurAmino can be a sole source of nutrition for infants up to 6 months of age and provide a major source of nutrition through 24 months of age. PurAmino is an Amino acid based formula for severe cow's milk protein or multiple food protein allergies. Has DHA and ARA, nutrients also found in breast milk that promote brain and eye development. Corn Syrup Solids (49%), Amino Acids (L-Aspartic Acid, L-Leucine, L-Lysine Hydrochloride, L-Proline, L-Alanine, L-Valine, Monosodium Glutamate, L-Isoleucine, L-Serine, L-Threonine, L-Tyrosine, L-Arginine, L-Phenylalanine, Glcine, L-Cystine, L-Histidine, L-Tryptophan, L-Methionine) (17%), High Oleic Sunflower Oil (10%), Medium Chain Triglycerides (MCT) oil (9%), Soy Oil (8%), Modified Tapioca Starch (3%), and less than 2%: Mortierella Alpina Oil(ARA), Crypthecodinium Cohnii Oil(DHA), Choline Chloride, Inositol, Ascorbic Acid, Niacinamide, Calcium Pantothenate, Riboflavin, Thiamin Hydrochloride, Vitamin B6 Hydrochloride, Vitamin D3, Folic Acid, Vitamin K1, Biotin, Taurine, Vitamin E Acetate, L-Carnitine, Vitamin A Palmitate, Vitamion B12, Calcium Phosphate, Potassium Citrate, Calcium Citrate, Sodium Citrate, Potassium Chloride, Calcium Hydroxide, Magnesium Phosphate, Ferrous Sulfate, Zinc Sulfate, Cupric Sulfate, Manganese Sulfate, Sodium Iodide, Sodium Selenite.